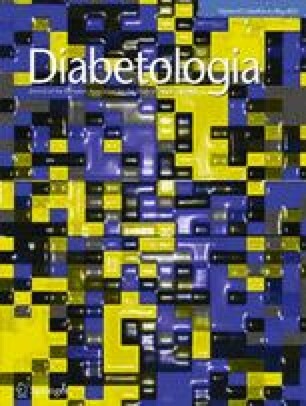 Insulin resistance in obesity and type 2 diabetes is related to abnormalities in mitochondrial oxidative phosphorylation (OxPhos) in skeletal muscle. We tested the hypothesis that mitochondrial oxidative metabolism is impaired in muscle of patients with inherited insulin resistance and defective insulin signalling. Skeletal muscle biopsies obtained from carriers (n = 6) of a mutation in the tyrosine kinase domain of the insulin receptor gene (INSR) and matched healthy controls (n = 15) were used for discovery-mode microarray-based transcriptional profiling combined with biological pathway analysis. Findings were validated by quantitative real-time PCR, immunoblotting and activity assays. In INSR mutation carriers, insulin resistance was associated with a coordinated downregulation of OxPhos genes in skeletal muscle. This was related to a 46% decrease in mRNA levels (p = 0.036) of peroxisome proliferator-activated receptor-γ coactivator-1α (PGC-1α), and 25–50% lower protein content of OxPhos subunits encoded by mitochondrial (ND6, p = 0.042) and nuclear DNA (UQCRC1, p = 0.001; SDHA, p = 0.067; COX5A, p = 0.017 and ATP5B, p = 0.005), as well as reduced citrate synthase activity (p = 0.025). Moreover, mutation carriers showed a marked reduction in type 1 muscle fibres (35% vs 62%, p = 0.0005) and increased type 2a fibres (53% vs 32%; p = 0.002) compared with controls. There were no differences in protein content and phosphorylation of 5′ AMP-activated protein kinase, p38 mitogen-activated protein kinase, Erk1 and Erk2. These data indicate that inherited insulin resistance coincides with reduced mitochondrial oxidative capacity in a PGC-1α- and muscle fibre type-related manner. Whether this co-existence is directly or indirectly related to insulin resistance remains to be elucidated. The online version of this article (doi: 10.1007/s00125-014-3187-y) contains peer-reviewed but unedited supplementary material, which is available to authorised users. We acknowledge L. Hansen, and C. B. Olsen, at the Department of Endocrinology, Odense University Hospital, and B. Bolmgren and C. Christensen at the Department of Nutrition, Exercise and Sports, Copenhagen University for skilled technical assistance. The study was supported by grants from the Danish Medical Research Council and the Danish Council for Independent Research (Sapere Aude, DFF Starting Grant), the Excellence Grant 2009 from the Novo Nordisk Foundation and the Lundbeck Foundation. This work is part of the research programme of the UNIK: Food, Fitness and Pharma for Health and Disease (see www.foodfitnesspharma.ku.dk/). The UNIK project is supported by the Danish Ministry of Science, Technology and Innovation. KH is responsible for the integrity of the work as a whole. JMK, VS, HB-N, JFPW and KH were responsible for the conception and design of the study. JMK, VS, SJP, NØ, JFPW and KH contributed to acquisition of data, and performed the analysis and interpretation of data. JMK, JFWP and KH drafted the manuscript, and JMK, VS, SJP, NØ, HB-N, JFWP and KH revised the manuscript critically and approved the final version.